speak among themselves. I will cover the Hbase specific protocols in this post especially protocol buffer ones. In the Hbase 0.96.0 release, hbase is moving to protocol buffers for communicating with different sub-systems. There are 5 major protocols which is used as shown in the figure above. MasterMonitorProtocol , Protocol that a client uses to communicate with the Master (for monitoring purposes). GetTableDescriptorsResponse: The TableSchema (see below for the description of TableSchema) for all the requested tables. GetClusterStatusResponse: The ClusterStatus object is returned. IsMasterRunningResponse: returns True if the master is available. MasterAdminProtocol, Protocol that a client uses to communicate with the Master (for admin purposes). AddColumnRequest: Add a column to the specified table. Req contains tableName: table to modify and column: ColumnFamilySchema. ModifyColumnRequest: Modifies an existing column on the specified table. Req contains tableName: table to modify and column: ColumnFamilySchema. MoveRegionRequest: Move a region to a specified destination server. The request that contains region:The RegionSpecifier destServerName: The ServerName of the destination regionserver. If passed the empty byte array we’ll assign to a random server. AssignRegionRequest: Assign a region to a server chosen at random. req contains the RegionSpecifier. Will use existing RegionPlan if one found. UnassignRegionRequest: Unassign a region from current hosting regionserver. Region will then be assigned to a regionserver chosen at random. Region could be reassigned back to the same server. Req contains a RegionSpecifier (Will clear any existing RegionPlan if one found) and a bool to say wether to force it or not (Will remove region from regions-in-transition too if present as well as from assigned regions — radical!.If results in double assignment use hbck -fix to resolve). OfflineRegionRequest: Offline a region from the assignment manager’s in-memory state. The region should be in a closed state and there will be no attempt to automatically reassign the region as in unassign. This is a special method, and should only be used by experts or hbck. Req contains the RegionSpecifier to make offline. Will clear any existing RegionPlan if one found. DeleteTableRequest: Deletes a table. Req contains the table name in bytes. EnableTableRequest: Puts the table on-line (only needed if table has been previously taken offline).Req contains the table name in bytes. DisableTableRequest: Take table offline. Req contains the table name in bytes. CreateTableRequest: Creates a new table asynchronously. If splitKeys are specified, then the table will be created with an initial set of multiple regions.If splitKeys is null, the table will be created with a single region. Also contains the TableSchema. StopMasterRequest: Stop HBase Master only. Does not shutdown the cluster. BalanceRequest: Run the balancer. Will run the balancer and if regions to move, it will go ahead and do the reassignments. Can NOT run for various reasons. Check logs. BalanceResponse: BalanceResponse that contains: balancerRan: True if balancer ran and was able to tell the region servers to unassign all the regions to balance (the re-assignment itself is async), false otherwise. SetBalancerRunningRequest: Turn the load balancer on or off. req SetBalancerRunningRequest that contains: on: If true, enable balancer. If false, disable balancer. synchronous: if true, wait until current balance() call, if outstanding, to return. EnableCatalogJanitorRequest: Enable/Disable the catalog janitor.contains: enable: If true, enable catalog janitor. If false, disable janitor. AdminProtocol, Protocol that a HBase client uses to communicate with a region server. GetRegionInfoRequest: Get the information of a region identified with RegionSpecifier. Also say wether to retrieve the compaction state (NONE, MINOR, MAJOR, MINOR_AND_MAJOR) of the given region. GetRegionInfoResponse: returns the RegionInfo and the comapction state (if requested) of the region. GetStoreFileRequest: Get a list of store files for a set of column families in a particular region identified with RegionSpecifier.If no column family is specified, get the store files for all column families. GetStoreFileResponse: A list of all store file names of the region. GetOnlineRegionRequest: Get information of all the region which are online in a particular region server. GetOnlineRegionResponse: list of RegionInfo of all the regions which are in online state in the given region server. CloseRegionRequest: Closes the specified region and will use or not use ZK during the close according to the specified flag. req contains RegionSpecifier, ServerName transitionInZK flag etc. CloseRegionResponse: A flag indicating that the region is closed or not. FlushRegionRequest: Flushes the MemStore of the specified region identified with RegionSpecifier on the region server. This method is synchronous. req has a optional timestamp above which the region should be flushed otherwise not. FlushRegionResponse: Has last flush time and a bool specifying wether the region was flushed or not (this field is not used in the code now). SplitRegionRequest: Split a region identified by the RegionSpecifier on the region server. This method currently flushes the region and then forces a compaction which will then trigger a split. The flush is done synchronously but the compaction is asynchronous. CompactRegionRequest: Compacts the region identified by RegionSpecifier. Performs a major compaction if the flag is set to true. This method is asynchronous. ReplicateWALEntryRequest: Replicates the given entries. The guarantee is that the given entries will be durable on the slave cluster if this method returns without any exception.”hbase.replication” has to be set to true for this to work. RollWALWriterResponse: A list of regions to flush. GetServerInfoRequest: Get some information of the region server. GetServerInfoResponse: Response contains the ServerName and the webui port. StopServerRequest: Stop the region server. req contains an reason to stop. ClientProtocol, Protocol that a HBase client uses to communicate with a region server. GetRequest: Get data from a table. Perform a single Get operation. Unless existenceOnly is specified, return all the requested data for the row that matches exactly, or the one that immediately precedes it if closestRowBefore is specified. If existenceOnly is set, only the existence will be returned. GetResponse: Contains the row to be fetched / the closest row before. If only existence was requested a bool is sent indicating if the row exists or not. MutateRequest: Mutate data in a table (APPEND, INCREMENT, PUT_DELETE). Perform a single Mutate operation.Optionally, you can specify a condition. The mutate will take place only if the condition is met. Otherwise,the mutate will be ignored. MutateResponse: In the response result, parameter processed (only in PPEND and INCREMENT) is sent back along with a bool ( for PUT and DELETE) which indicates if the mutate actually happened. ScanRequest: Instead of get from a table, you can scan it with optional filters. You can specify the row key range, time range, the columns/families to scan and so on. A scan request. Initially, it should specify a scan. Later on, you can use the scanner id returned to fetch result batches with a different scan request. The scanner will remain open if there are more results, and it’s not asked to be closed explicitly. You can fetch the results and ask the scanner to be closed to save a trip if you are not interested in remaining results. req contains a RegionSpecifier. ScanResponse: Contains the result of the scan (rows). If there are no more results, moreResults will be false. If it is not specified, it means there are more. LockRowRequest: Lock a row in a table explicitly from the client. Req contains RegionSpecifier. LockRowResponse: Returns the lock id and TTL (not implemented in code yet)of the lock. UnlockRowRequest: Unlock a locked row in a table. req contains the RegionSpecifier and the lockId. BulkLoadHFileRequest: Atomically bulk load multiple HFiles (say from different column families) into an open region. Req contains RegionSpecifier and Column name and the file path. BulkLoadHFileResponse: A bool indicating wether the files are loaded or not. ExecCoprocessorRequest: Executes a single org.apache.hadoop.hbase.ipc.CoprocessorProtocol method using the registered protocol handlers. Req contains the RegionSpecifier. An individual coprocessor call. You must specify the protocol, the method, and the row to which the call will be executed. You can specify the configuration settings in the property list. The parameter list has the parameters used for the method. A parameter is a pair of parameter name and the binary parameter value. The name is the parameter class name. The value is the binary format of the parameter, for example, protocol buffer encoded value. ExecCoprocessorResponse: Result of the call. MultiRequest: Execute multiple actions on a table: get, mutate, and/or execCoprocessor. You can execute a list of actions on a given region in order. If it is a list of mutate actions, atomic can be set to make sure they can be processed atomically, just like RowMutations. MultiResponse: List of action due to the operations happened. 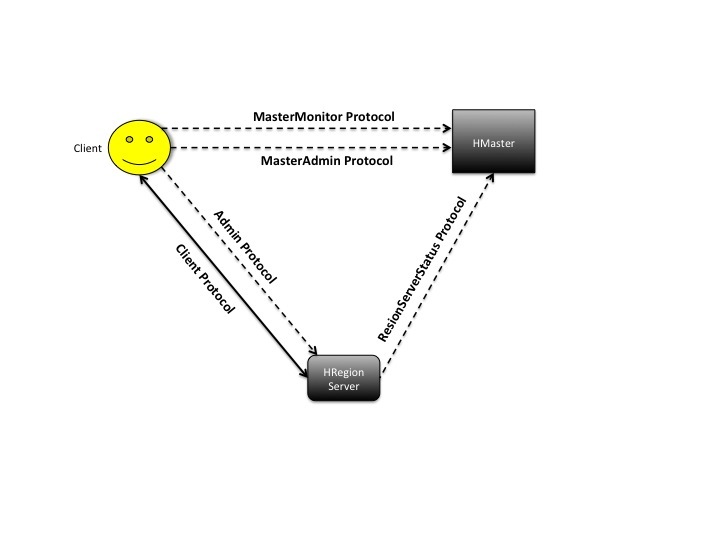 RegionServerStatusProtocol, Protocol that a RegionServer uses to communicate its status to the Master. RegionServerStartupRequest: Sent when the region server first starts up. req contains port num, start code, and the server current time in ms.
RegionServerReportRequest: Periodical report sent from region server (ServerName) which contains ServerLoad. ReportRSFatalErrorRequest: Report the Region Server abort (may be due to Oom or HDFS problems) to master. Req contains the ServerName and error Message. ClusterId : Content of the ‘/hbase/hbaseid’, cluster id, znode. RegionState: State of the region while undergoing transition. Has RegionInfo, State and the timestamp. RegionInTransition: Identifies all the regions in Transition. Has RegionSpecifier and RegionState. LiveServerInfo: Describes each Live server with its ServerName and the current ServerLoad. The count and names of region servers in the cluster. The name of the active master for the cluster. The name(s) of the backup master(s) for the cluster, if they exist. The number of regions deployed on the cluster. The number of requests since last report. per server and per region. Has HBaseVersionFileContent, LiveServerInfo, ServerName (for dead servers), RegionInTransition, ClusterId, Coprocessor, ServerName (for master), ServerName (for backupMaster) etc. TableSchema: Describes a table, has Table name and ColumnFamilySchema for each column family present. ColumnFamilySchema: Describes the column family name and other attributes like Bloom filter, inMemory etc. RegionInfo: Protocol buffer version of HRegionInfo. Has information like regionId, table name, start key, end key etc. RegionSpecifier: You can specify region by region name, or the hash of the region name, which is known as encoded region name. RegionLoad: Describes the Load on a given region server. Has informations about store files, req counts, index size and bloom size. ServerLoad: Describes the load on a given server. Has information like req count, memory used, RegionLoads, Coprocessor etc. KeyValue: The generic key type used in HLog. Has information like row, family, qualifier, timestamp, and the key type for mutable operations. ServerName: Host , port of a server. NameStringPair: A generic name value pair in String format. NameBytesPair: A generic name value pair in bytes format. RpcException: The Server sends an exception message if the request throws an exception. It contains the class which threw up and the stack. RpcResponse: The server sends back a RpcResponse object as response.At the data level this looks like <protobuf-encoded-length-of-serialized-RpcResponse-obj><RpcResponse-object serialized>. RpcException is optional here. RootRegionServer: Content of the root-region-server znode which contains the ServerName hosting the root region currently. Master: ServerName of the current master store in master znode. ClusterUp: Content of the ‘/hbase/shutdown’, cluster state, znode. If this znode is present, cluster is up. Currently the data is cluster startDate. RegionTransition: What we write under unassigned up in zookeeper as a region moves through open/close, etc., regions. Details a region in transition. Contains originServerName, regionName, createTime etc. SplitLogTask: WAL SplitLog directory znodes have this for content. Used doing distributed WAL splitting. Holds current state and name of server that originated split. Contains state and SevrverName. Table: The znode that holds state of table (Enabled, Disabled etc). If no znode for a table, its state is presumed enabled. Excellent post !! Very informative ! !